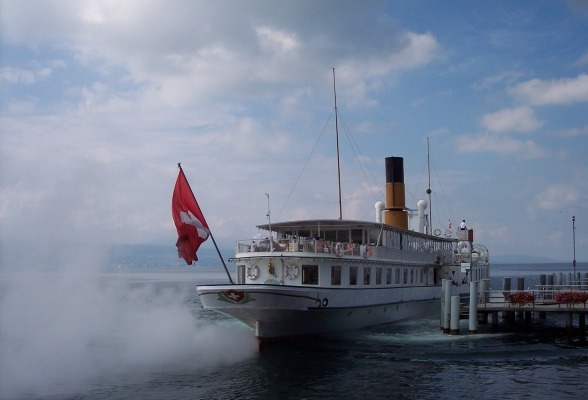 A classic Lake Leman steamer. When on the Via Francigena, there are precious few opportunities that come your way in regards to being ferried about instead of walking. Such an opportunity arose in travelling from Lausanne to Vevey – by ferry. In the morning, with the bright sun beaming in the sky, we walked down to the wharves at Ouchy past a metal fountain with the heads of three horses drinking. Finding the tourist office we booked two seats on one of the classic lake ferries. The ferry would take us to Vevey after which there was a 4 km walk to Montreux. Holiday makers crammed themselves onto the ferry and the attendants cast off. We passed the Nestle Company’s head quarters and the vineyard covered slopes of the surrounding foothills. Passengers enjoyed aromatic Swiss coffee and rich creamy cakes as the ferry chugged its way to Vevey. Lake Leman and its surrounds were definitely postcard material. As we disembarked a woman shouldering a solid-looking backpack asked if we were walking the Via Francigena. “Yes we are,” Carol answered. “I couldn’t help noticing the Camino badge on your pack,” the woman added. She introduced herself as Alison, from Nottingham in England. She was also traveling the Via Francigena and had, until Lausanne, covered the distance from Canterbury on foot. Alison was about to catch another ferry as she had to reach the town of Aigle that evening. A brief comparison of our respective timetables revealed that we would meet up again at the Grand St. Bernard Pass within a week’s time. Alison walked off to find her ferry while we went to enjoy a coffee and visit Vevey’s memorial to Charlie Chaplin, the actor immortalized in the role of The Little Tramp. Chaplin had retired to Vevey and spent the last years of his life in this pleasant lakeside town. It turned out that Alison was Alison Raju, the well-known guide book writer, especially about the Camino. For walkers, the only way to Montreux was along the main road, as the grounds of mansions had monopolized all access to the lake. The heat made walking a challenge. Covered in perspiration we made our way to Hotel Helvetie, once a grand hotel now showing signs of genteel decay. There we unpacked and enjoyed a pleasant afternoon tea in the hotel’s classic tea-rooms.